Mind Fingers: This Post May Not Be Entirely True. Which maybe sounds a little crazy. But I like it. I probably didn't love it when I was a kid, but I don't really remember. And my dad always made us the coolest gifts, so I doubt I was doing much complaining. It takes a ton of the stress out of gift giving. Instead of trying to divine what that one special thing is that they want most in the world, you get to figure out what YOU want to give THEM. Homemade gifts fit perfectly into this philosophy. At this point I was going to go off on a lecture about how wonderful and important homemade gifts are, but it was really boring. And being bored is something up with which I will put. I'll just sum up by saying that I made a bunch of gifts this year and bought a lot less, in hopes of enjoying the season a little more than I usually do. I know making gifts adds more work, but I stress and stress over what gifts to buy for people and by the next year I can't even remember what I gave them, and they probably don't either, so what was the point? At least I remember the stuff that I make. And if it is really ugly, or I REALLY mess it up, the chances are that they are going to remember it too. Those are Special Christmas Memories, right there. So now, you lucky dog you, I'm gonna show you what I made this year. Don't ask me why. I just want to. Ready? I made one of these for my mom and one for my mother-in-law. 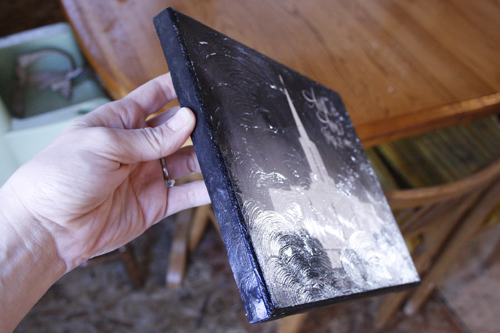 It is an 8x10 picture glued onto canvas, which I bought at Walmart. I followed this tutorial. I got the pictures here, but there are some really nice temple pictures here as well. In photoshop I added names and wedding dates, and printed them at Winkflash for less than a dollar each. Very cheap and easy. Just like me! I gave this one to my mom and she said, "Oh, that is so pretty, but Elesa. . . that is not the right temple." Let's check again, shall we? I said, "Uh yeah, that's the Jordan River Temple, isn't it?" She said, "Yes, but we weren't married in the Jordan River Temple." My husband said " I could have told you that. The Jordan River Temple wasn't even build in '67"
I sweetly told him where he could stick his very useful but Much-Too-Late knowledge of temple history and asked my mother what temple she WAS married in and she had the nerve to say, "Logan". I won't bother recounting our entire conversation. The language isn't suitable for a family friendly blog like mine. But I tried very hard to convince her that she was wrong. 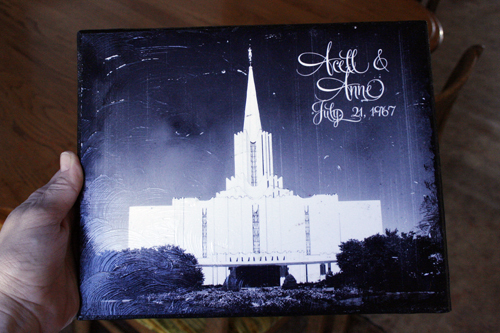 I've ALWAYS known my parents were married in the Jordan River Temple. Every time we drive passed it I think "There is the temple where my parents were married." It has always been so. And now she is telling me they got married in the Logan Temple? It is ridiculous! How does she know anyway? It was a long time ago. It was a very exciting day, and her eyes were so filled with starlight and love that she could have been married on the moon for all she would remember! I threw the picture on the floor, and as I stormed out I shouted, "I'll give you what I want to give you! Not what you want to get!" Crazy old woman. And now my mom will probably say that she doesn't remember the conversation going like that at all, which just further proves my point, that it is her memory, and not my gift, which is flawed.